The Brufut Education Project began as a grassroots endeavour to improve access and quality of education in the village of Brufut, The Gambia. The project was founded by Mustapha Ndure, a Gambian resident in the UK, whose family compound in Brufut was chosen as the site to house the school. Mustapha’s late father, Maam Samba Ndure, a village elder, was dedicated to uplifting the youth of Brufut through education. He was often to be found teaching children to read under the shade of the mango trees. A dedicated team of volunteers began fundraising in the UK in 2007, and in 2009 construction began. European volunteers returned year after year, working in partnership with the people of Brufut to build the school. By spring of 2014, construction of the main building was complete. The school currently employs eight teachers, two caretakers, four cooks, one storekeeper and one administrator. The students age 4 and upwards, including nursery, Arabic, computer, sewing and adult literacy classes. At present over 300 students use our facilities on a daily basis. The project is governed by a board of directors which includes honourable members in The Gambia, the UK and Canada. Over the years we have been supported by: the Al Madinah Mosque in Barking, East London; Sharjah Oxygen co in Dubai; and honourable donors across Europe and North America. 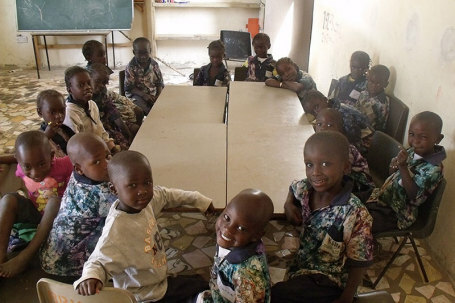 We aim to be a model school in The Gambia, open to all, providing quality education to uplift the youth of Brufut. The Brufut Education Project began as a spontaneous association among friends and volunteers from around the world. As our work has progressed, set jobs and duties have been assigned to individuals, although in total there are over 40 staff and volunteers actively involved in the project. The founder of the project, Mustapha is a painter who divides his time between London and Gambia. centre of learning for the community. Our head Arabic teacher in Brufut, Bakaramo has been teaching the children of the community for the last twelve years, first under the shade of a mango tree and now in our school. Mr. Danjo is our head nursery teacher in Brufut. Native of Sukuta, he has many years experience working with children and is much loved by the kids in Brufut.